The European Commission on Tuesday will rule that Apple received illegal state aid from Ireland, according to a 130-page judgment known by Financial Times. Competition commissioner Margrethe Vestager circulated the final ruling to her counterparts in the EU’s executive branch only on Monday morning, deploying a fast-track procedure in a bid to minimize leaks. The usual notice period is two weeks. The ruling follows a three-year investigation into Apple's tax arrangements in Ireland, where it has reportedly paid around 2% or less in taxes compared to the country's headline 12.5% corporate tax rate. The commission's ruling asks Dublin to raise a new tax assessment on Apple, which could have to restate its accounts as a result of the ruling, according to the report. One area of focus is Apple's tax arrangements for its intellectual property assets, which is "a hotly disputed area likely to lead to a large claim for back taxes." 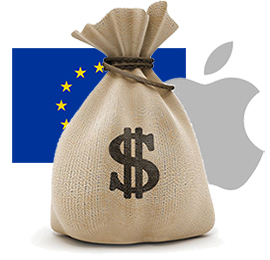 The ruling means Apple could owe several billions of euros in back taxes. JPMorgan estimated the company could be forced to pay up to 19 billion euros ($21.2 billion) in back taxes, although a previous study placed the figure around $8 billion, and some analysts believe the amount could be a comparatively lower $1 billion. Europe's competition commissioner Margrethe Vestager will provide an actual estimate of Apple's potential tax bill when the European Commission's findings are publicly released on Tuesday, according to the report. Apple declined to comment on the matter, reiterating that the company fully complies with international tax law and that it is the largest taxpayer in the world. Apple said last month that both the company and Ireland would appeal any unfavorable ruling in European courts. Apple joins the ranks of Starbucks, Fiat Chrysler, Amazon, Google, IKEA, and McDonald's as one of several large corporations accused of tax avoidance in Europe recently. Starbucks in particular is currently appealing its case in Netherlands, where it was ordered to pay as much as 30 million euros in back taxes. Last week, the U.S. Treasury department warned that an adverse ruling against Apple could "set an undesirable precedent." It also said the European Commission is becoming a "supranational tax authority," going beyond acceptable enforcement of competition and state aid law and singling out U.S. companies. Time for Apple to pay the Taxman. Good job EU, I sincerely hope it is in the 21B neighbourhood, even though I am an apple fan. world war III won't involve bombs - its going to be a war of taxes. So I assume the European union wants the U.S. to raise taxes on European companies doing business here. Who ultimately will be the ones hurt - us the consumers. Thank you EU for another of your moronic decisions. No wonder England left. Which European companies get away with 2% tax in the US? Good! I hope it drains the cash reserve enough for them to actually make good products again. If your not sitting on a large pile of cash...you might not be able to risk selling Macs with 3 year old tech in them for a premium. Timmy might actually have to put some thought into product design and not release the same iPhone every year. I really hope the EU sticks it to them. So, consumers should pay it instead of shareholders? But that's just it, they are earnings. Consumers didn't have to give them their money but Apple created a superior product and earned the profit. While I agree "loopholes" should be closed, you need to be careful eliminating the incentive to innovate. in what universe did they "avoid" taxes??? Ireland isn't smart(/independent) enough to determine its own tax rate? So you support higher taxes? I sure don't - I'm taxed ENOUGH!! So, you think 2% is a fair tax for a company while I personally pay close to 40%? will the iPhone 7 be $300 more to compensate? That's odd. Does that mean that every foreign company in Ireland will be hit with back taxes as well? The issue is not about being taxed in Ireland but about Ireland giving a selectively lower taxation to Apple and such Apple-ad-hoc taxation being considered state aid. Apple should pay taxes in a country where they make profit/do business, now all they do is to go to just one country with 2% tax rate and avoid paying more tax in all other EU countries so I guess it's fair to say that Apple IS part of the problem.